In what I think will become a weekly regular, Monday Minute allows me to pass on tidbits from marine folks I have known over the years. Often a comment during a boat tour, or an off-handed remark as we walk through a facility, these words of wisdom are buried in the pages of my many notebooks from PMM. While they don't fit the scope of a blog post or demand the space of an article, they are pearls of wisdom you will want to know. In this post, it is why you should be prepared to replace your exhaust mixing elbow more frequently than you thought. There was a recent thread regarding the benefits and disadvantages of water-cooled exhaust systems versus dry exhaust systems in one of the Facebook pages. It reminded me of my frequent comments on the subject in my notebooks from seminars and trips to manufacturers. Exhaust systems do seem to get a lot of attention from experienced cruisers who have their share of system issues. No matter whether you have a trawler, sailboat, inboard fishing boat or even Dave Pike's Walker Bay dinghy trip around the Great Loop (where he sucked eel grass into his Honda's cooling system), it seems the engine's exhaust system contains the most problematic areas and potential failures of any other system of a boat. Westerbeke's Tom Sutherland once told me he thinks exhaust systems are the single biggest problem area of pleasure boats. With his many years in this business, Tom believes they are the Achilles Heel of an inboard powered boat, sail or power. If you ever talked with Tom at a boat show, you probably associate Tom Sutherland with the Westerbeke line of marine generators. But Tom's background spans lots of years at the New England company, long a provider of marinized propulsion engines to OEM builders in addition to its marine generators. When you work for an engine company, you see first hand what works well without incident and what components routinely cause headaches for both owners and eventually the company's warranty department. Issues work their way back to the engineering and manufacturing departments, and continued R&D attempts to eliminate them. So Tom's assessment is based on lots of repeat scenarios. He specifically mentioned that exhaust system mixing elbows for water-cooled exhausts are particularly vulnerable and should be replaced on a regular basis, perhaps no longer than five-year intervals. As long as an exhaust system operates in salt water, it doesn't matter to Tom how many hours it has on it. Given the corrosive nature of the environment, five years is a good point to pull the parts, inspect them carefully, but be prepared to replace the elbow(s) without hesitation. Exotic materials may extend this time frame, but for production exhaust components, that is about what you should expect in service life, whether it is a gas engine runabout, a diesel generator, or a main diesel engine. For salt water-cooled exhausts, that is the price of operation. For a time, everyone assumed that dry exhausts, as popularized in the Nordhavn 46, represented the ultimate exhaust solution. Dry exhausts eliminate salt water corrosion. That is still true, but after years of experience, dry exhausts are not with out their own issues. These systems create enormous heat which must be engineered safely away, the systems take up interior accommodations space, and they can spread soot over the boat at start up (and sometimes over the neighborhood boats in the right conditions). This bellows and exhaust pipe is usually covered in a thick, heat-insulating blanket. The dry exhaust system must address cycles of extreme thermal expansion and vibration/movement of the running engine in an installation that also is well secured as it runs up a boat's interior to an exhaust stack above the boat. This constant movement can cause metal fatigue in the metal slip joints and welded fasteners that work to mitigate vibration and movement issues. Exhaust bellows are designed to give with the movement, but they are not foolproof and can fail after thousands of hours. But if engineered correctly, dry exhaust systems have their fans, who don't mind cleaning the keel cooler of marine growth in tropical waters to keep the engine from overheating. 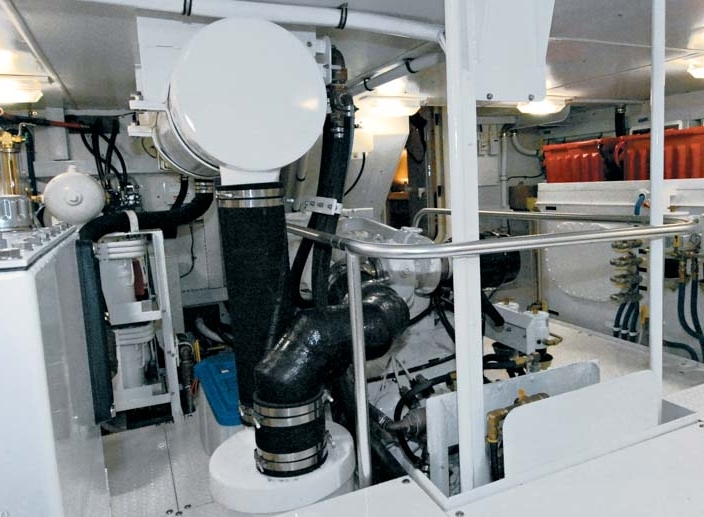 In addition to other considerations, for the most part on recreational boats, our propulsion engines and generators use water-cooled exhausts, which offer quiet operation, much lower temperatures in engine spaces, and they generally work well...until they don't. Sucking up plastic material into a raw water strainer can be a minor issue if access is good. Having corroded welded elbow seams let go can be avoided by periodic replacement of these components, although the cost of doing so may be more than one expect. Some exhaust mixing elbows exceed $1000 for the specialty hand-made product, not an insignificant sum when viewed as a consumable product. On a smaller propulsion engine, such as one finds on a sailboat or smaller efficient motorboat, these elbows are often cast products that cost less than $200, so carrying a spare is not a difficult proposition. And removing it every so many years (again five years is what many consider the upper limit of the replacement zone, regardless of engine hours), carefully inspecting it for corrosion and carbon buildup, and either replacing it or cleaning/reinstalling the elbow, is one's choice. But the point is to avoid waiting until it fails, which is almost certain to happen when it won't be fun in terms of timing or clean up. Until we are maintaining all-electric propulsion drives or engines powered by dilithium crystals, our combustion engines employ exhaust systems that we need to remain aware of, so we can enjoy our time on the water. But Tom Sutherland is right. Exhaust systems have no silver bullet, and remain the Achilles Heel of boating.